Foiled by an art book. It looks like the Mass Effect Andromeda release date has been leaked by Amazon. Destructoid has spotted a listing for The Art of Mass Effect: Andromeda has a hardcover release date of March 21, with the description stating that Dark Horse will release the book "simultaneously with the game." This could be a placeholder but that date happens to be a Tuesday so prime release day material. We also already knew that the game is coming in the final quarter of EA's financial year (which is January to March). A little bit more about the Ryder family was revealed last month when the Mass Effect Andromeda creative director revealed that the male and female characters were brother and sister. 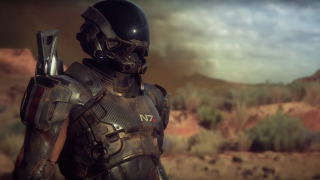 Hopefully we'll get some more info on N7 day - that's November 7 to everyone else.